Home FOOD & DINING NEW ORLEANS GOURMET Oh My Gourd! Being born on Halloween, it’s only natural to have an affinity for pumpkins. I have fond childhood memories of my typical birthday bash, complete with sugar-saturated schoolmates dressed like ghouls and goblins screeching with excitement as we waited with great anticipation for our turn to take a swing at the candy-filled pumpkin piñata, knowing all the while that any moment an explosion of sugary treats could erupt, sending the crowd scampering wildly to the floor. Unlike typical 6-year-old-girl birthday cakes (the ones adorned with pink or lavender icing flowers that everyone fought over), my cake was a bright, flaming orange jack-o-lantern, artfully decorated with triangle-shaped eyes and a broad, jagged-toothed smile. Back then, I never dreamed of eating real pumpkin, but the thought of that moist yellow cake generously slathered with sugary icing drove me wild! I am happy to say, that over the years my palate has evolved, and I have come to appreciate all sorts of gourds, from acorn squash to zucchini, in their true and glorious forms. “Cucurbit” is a general term used to describe all members of the Cucurbitaceae family, which includes pumpkin, squash, melon, cucumber, watermelon and gourd. This complex family consists of more than three genera and seven different species, and to complicate the matter, several members, pumpkin for one, are found within more than one family. Clouding the issue even further, pumpkin and squash are used interchangeably, depending upon region. The exception is the decorative Halloween type, which is universally referred to as a pumpkin. This collection of fruits and vegetables, some edible while many are purely functional or decorative, are incredibly diverse. They vary dramatically in shape, color and size, ranging from tiny, marble-size examples to record-holding giants, weighing more than 1,000 pounds and measuring more than seven feet long. Summer squash fruits are fast-maturing, with thin, soft rinds that are easily bruised, are generally consumed when they are immature and have a shorter shelf life than do their winter counterpart. The most frequently grown types in the United States are zucchini, yellow straight neck, yellow crookneck and scallop. 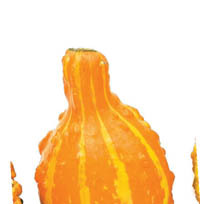 Winter squash fruits can have many different shapes and colors, but all have a hard rind. They take longer to mature, but they last longer than do summer squash and are consumed when the fruit and seeds are completely mature. Common examples include acorn, butternut, buttercup, spaghetti and pumpkin. Squash types with round orange fruit are referred to as pumpkins and are mainly used today as Halloween decoration rather than as food. Fruits are harvested at full seed maturity, but generally do not store as well as other types of winter squash. The flesh is generally a little too coarse and strong-flavored for eating, so most “pumpkin” pies are actually made from winter squash. Gourds, which have been cultivated for both ornamental and utility purposes for many years, are typically valued for their hard outer shell or fiber rather than for consumption. Although there are a number of different species referred to as gourds, they are easily distinguished from one another, unlike pumpkins and squashes. Depending on the type of squash, calories range from 50 to 125 per cup. A 4-ounce serving of squash provides 20% or more of your recommended daily value of magnesium, potassium and vitamins A, C and E (vitamin E is found in the seeds). Squash is also an excellent source of calcium and fiber. High in nutrients and flavor, squash is also remarkably high in antioxidants and beta-carotene. Preheat oven to 350°F and grease the baking sheets. Sift the flour, cinnamon, ginger, cloves, salt and baking soda into a large bowl or onto a sheet of parchment paper. Cream the butter and both sugars in the bowl of an electric mixer, using the paddle attachment. Add the eggs and pumpkin and mix until fluffy. Stir in the sifted ingredients at a slow speed, until just mixed, then stir in the walnuts and raisins. Drop by the tablespoon onto greased cookie sheets and bake for about 12 minutes, until the tops are set and the cookies are golden around the edges. Use a fork to drizzle glaze onto the cookies after they have completely cooled. Whisk the ingredients together in a small bowl.